Our wonderful students from University Campus Barnsley (UCB) and Barnsley College have been honoured in this year’s Graduation ceremony. 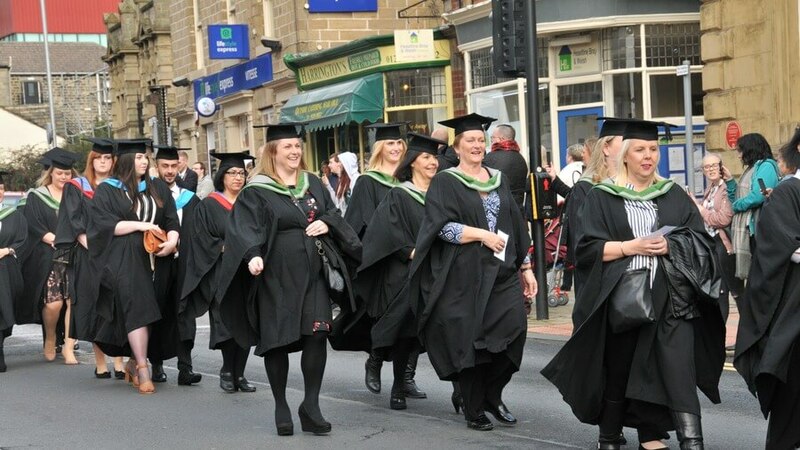 Led by a local brass band, students processed from UCB on Church Street to The Civic with many members of the public and local businesses lining the streets to support the graduands as they processed. The ceremony, for those students who have completed Higher Education courses at UCB and Barnsley College over the last year, was attended by graduands, their guests and VIPs including senior college staff, Her Worshipful the Mayor of Barnsley Cllr Linda Burgess, the High Sheriff Dr Julie MacDonald and the Lord-Lieutenant of South Yorkshire Mr Andrew Coombe. Local best-selling author, poet and columnist Milly Johnson gave an inspiring and entertaining keynote speech as she shared her own experiences and gave advice to the 91 graduands about overcoming life’s challenges with self-belief and a determination to succeed. Lorraine Copley, Dean of University Campus Barnsley congratulated each and every graduand as she presented them to Barnsley College Principal and Chief Executive Christopher Webb and Vice Chair of Governors Paul Jagger to receive their awards.